Yesterday Twitter announced that it has started field testing of its new Tweet buy button. 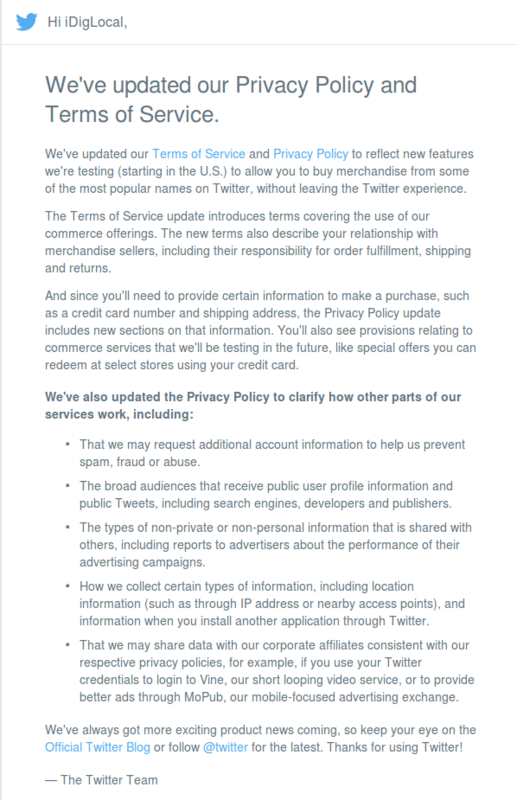 Today we received emails from Twitter announcing that they have updated there terms and conditions, a Copy of the email that we received appears at the bottom of this article. Obviously this is Twitter looking to add another income stream for its business so that it is not solely reliant upon advertising per se. As a service it will raise two issues. Firstly, how will this new service affect its current 271 million a month active users? Secondly, how will this perform as a merchant service; what will the benefits of this service be for users running an internet shopping website? As to the first point, we would suggest that intrusions by advertising into a users Twitter feed already exist, the damage has already been done as it were. Twitter ads have been with us since 2010 with Promoted Tweets and so the respective changes in privacy has been an ongoing process since this time. The general trend is for a more detailed definition of what Twitter can do if you sign up to use their services, chiefly around the sharing of information and of course there new clauses in relation to the actual process of carrying our online payment transactions. In general most users are already doing this via other platforms so it seems of little consequence that another platform is joining the trend. The question is, how successful is a tweet going to be in convincing a “Joe Bloggs” or indeed a “Jane Bloggs” to press that Buy button? What are Tweet conversion rates going to be? Our feeling is that the types of products that can be sold via a tweet is going to be limited. As it stands, Twitter is aware of this by all accounts. The trial is aimed at selling “time-limited” products. According to the New York Times Nathan Hubbard, who is leading Twitter’s “buy” button project, said it is “unclear what types of products customers might want to buy on Twitter, although he suspected that what would do best was anything that is perishable, that has a temporal component to it, or a sense of urgency“. Part of this is due the limitation on the content that can be sent in a Tweet. A photo and 140 characters does not give a lot of room. The other aspect is Twitters verification of accounts. Twitter users will need confidence that they are buying items from a reputable outlet, not a bogus account. This could be achieved by rolling out Twitter account verification status more broadly. Currently, unless you are famous either individually or as a brand you are not going to get that tick mark next to your account name to show that you are who you say you are. If Twitter really want to push their merchant functionality then the verified status of accounts needs to be expanded. So, for the time being nobody knows, including Twitter, how well this is going to work. Of course the more common place it is the more likely people will be to use this type of service. It should work very well as a mobile interface for merchants. With the rapidly growing use of Smartphones and Tablets as platforms from which to make online purchases perhaps the future for the Tweet Buy button is good.